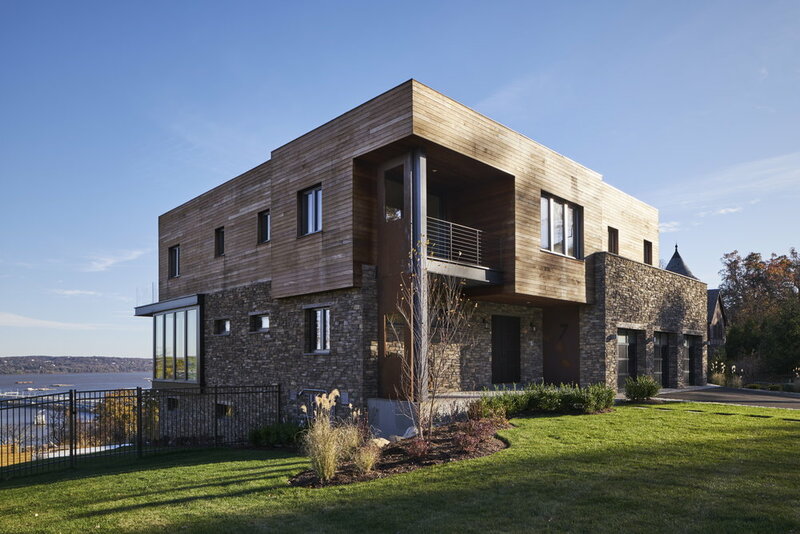 Perched on a steep drop off that leads to the Hudson River with magnificent views of the new Tappen Zee bridge sits this modern sculptural house for a friend of Highlands who specializes in high end glass work. The goal was to take advantage of the steep site and fabulous views. Combining traditional stone veneer as an anchor to the multi layered series of boxes make for the house's unique character. The home is both modern but warm and welcoming. The Boxes, clad in Ipe siding, slide back and forth — always taking advantage of the unique site. A series of terraces made from blackened steel sections slip out of the back of the house and are caressed by slivers of glass railings. A glazing system manufactured by Sokolka is used throughout the home allowing views and light to pour into space. A three-story fireplace of stone veneer slides through the home and is flanked by more glazing allowing it float yet anchor the home. Symmetrical to the fireplace is a three-story metal and glass stairway that creates a centralized core to the interior. This is truly a unique home in a great location.